Psyrri is one of the oldest neighborhoods of Athens. Originally occupied by craftsmen you can still find small shops of antiques, sandal makers, wooden handicrafts and others. Along with those stores there are many restaurants and bars. 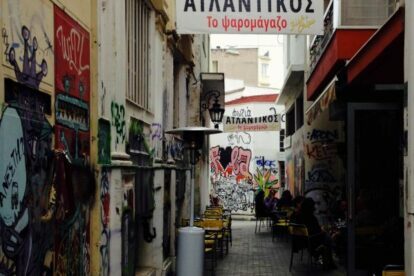 In one of the smallest streets of Psyrri, covered in graffiti, is one of my favorite places in Athens, Atlantikos. Being a big fan of seafood and fish, I was excited to find out that Atlantikos is a fish restaurant in the middle of the city center! Here you can find freshly prepared fish, usually what they have found on the same day at the nearby Varvakeio Market: tuna, salmon, sea bass, cod, sardines and much more. You can also find fried calamari (typical summer food) but also fresh salads and freshly fried potatoes (mom style). For a quick snack, the fried fish sandwich is a great choice.